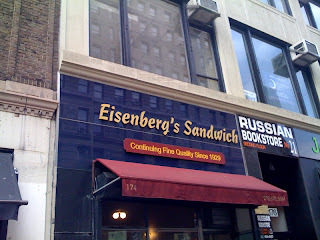 Eisenberg's Sandwich Shop was included on Anthony Bourdain's list of old school and uniquely New York institutions in his "Disappearing Manhattan" episode of No Reservations. On Eisenberg's Sandwich Shop Bourdain said "Continuous service of these fine [lime rickeys and egg creams] for 70 years, sublime tuna salad on white, and prices that are pretty much along 1985 lines. But most important, this is not some lame-o Johnny Rockets recreation, this is the real thing." We're not followers but we definitely trust Bourdain's food taste. So weeks ago we found ourselves across from the Flatiron building at Eisenberg's (between 22nd and 23rd streets on Fifth Avenu. The interior is small and narrow and probably for the full experience you should sit at the counter. The decor and their menu apparently hasn't changed much since it opened in 1929 when it catered to the working class people in the area. 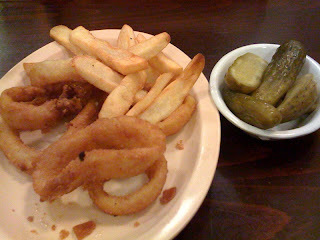 The onion rings and fries were basic. The pastrami sandwich was dry. We wouldn't order this again. But their tuna salad on white bread was excellent. Their menu has the right mix of things we'd want at a New York sandwich shop. Their beverage list still includes milk shakes and chocolate milk. But you apparently have to know what to order here or the experience will be very hit or miss. Stay away from the pastrami sandwich and burgers. Order the tuna salad. 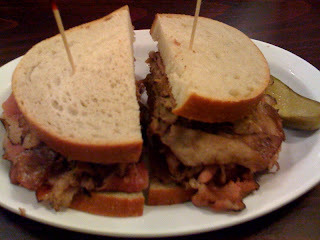 Other recommended items included their BLT and Reuben sandwiches. 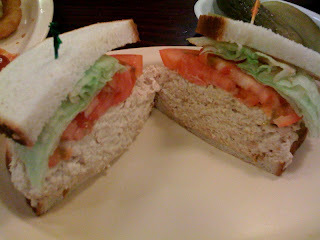 On our next trip back, we will try the tuna and egg salad combo sandwich. The service was okay but that was to be expected of a place like this with one waiter (and definitely better than the kind of overly rude service you'd receive at Katz's). We'll end with this quote from a 1998 New York Times article on Eisenberg's Sandiwch Shop: "If this tiny, kevetcy little shop were a person, it would be Mel Brooks doing the 2,000-year-old-man."